Adrian Clarke looks at tactical battles set to take place in Matchweek 8. Chelsea’s outstanding central midfielders have displayed supremacy over most opponents this season, but Southampton’s Pierre-Emile Hojbjerg will relish the challenge of competing against them this weekend. The Dane has produced a series of first-rate performances for Saints across the past few matches. Scoring excellent goals against Crystal Palace and Brighton & Hove Albion, he also dominated Wolverhampton Wanderers' impressive pairing of Joao Moutinho and Ruben Neves last Saturday, despite ending up on the losing side. While gaining the upper hand over a star-studded Blues trio of Jorginho, N’Golo Kante and Mateo Kovacic will present a stiffer test, Hojbjerg can take confidence from the fact he is now an influential Premier League performer in his own right. In all facets of his game the 23-year-old’s output is unrecognisable compared with the levels he produced last term, when he spent the campaign drifting in and out of the Southampton team. He now continually shows for the ball, passing it short and long with precision. He has become the man who makes Mark Hughes’s side tick. 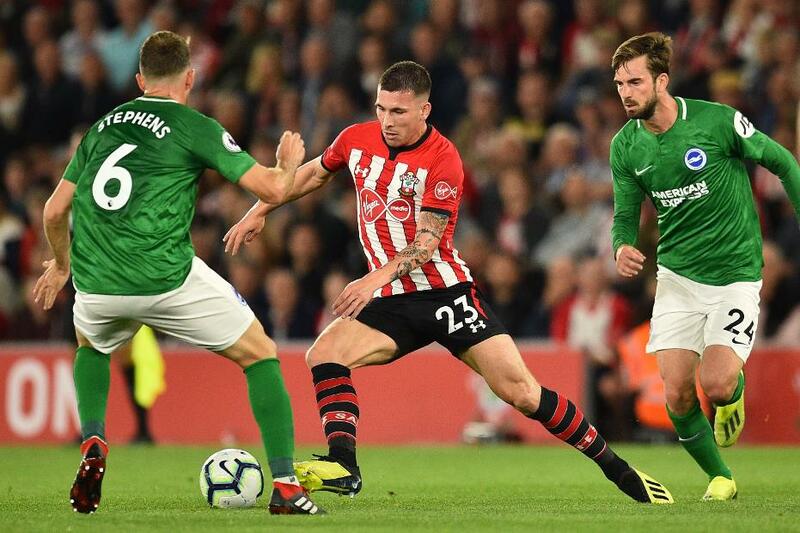 The south-coast club are averaging just 47.9 per cent possession, compared with 51 per cent last season, so it is remarkable that Hojbjerg is making 21 extra passes per match. Regaining possession with greater aggression and contributing more in advanced areas, the Denmark international has raised his all-round standards. Looking at his numbers, Hojbjerg might just be the fastest-improving player in the Premier League. Southampton have built from a more solid midfield platform and their performances have been better than their results suggest. They have not fallen short for creating goalscoring opportunities. Indeed, they have had more shots this season than Tottenham Hotspur, Arsenal and Manchester United. However, for the second campaign running they have struggled in front of goal, missing too many good chances. This is a key reason why Southampton lie 16th with just five points. Does Hughes stick or twist? Southampton have experimented with different formations since Hughes took charge, but this season they have been at their best in a 4-4-2 system. Mimicking Watford’s approach to some extent, they have tried to play in a more attacking manner. It would be a positive step to persist with this shape against Chelsea, with Hojbjerg partnering Mario Lemina in central midfield. However, Southampton’s head coach may consider repeating the tactical tweak he made at Liverpool. Switching to 4-1-4-1 he sacrificed a striker to use Oriol Romeu as a holding midfielder. This more defensive stance did not have the desired effect in a 3-0 loss but it would, in theory, match up Chelsea man to man in the middle of the park. If Hughes is prepared to give Hojbjerg and Lemina the chance to take on Chelsea without an additional midfield enforcer, it will be a sign of the trust he places in his Dane.